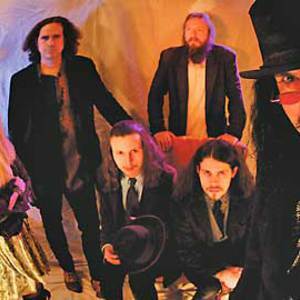 Gandalf Murphy & The Slambovian Circus of Dreams is a Hudson Valley New York based band, which was founded in Sleepy Hollow in 1998. The band regularly plays the major folk music venues and coffeehouses in the Northeastern United States, often to sold out crowds. They also tour in other regions of the United States The flavor of the band is best captured by a live concert, or by one of their live recordings. Some fans travel hundreds of miles to attend concerts. The flavor of the band is best captured by a live concert, or by one of their live recordings. Some fans travel hundreds of miles to attend concerts. A high point of the year for many fans is the Grand Slambovian Hillbilly Pirate Ball, an annual costumed event held near Halloween. In 2007 the Circus performed at a number of major folk festivals, including the Strawberry Music Festival in Yosemite, Falcon Ridge Folk Festival in Hillsdale, NY, the Rocky Mountain Folks Festival in Colorado, the Hardly Strictly Bluegrass Festival in San Francisco, and many other regional festivals.